The chocolate caramels came in sets of five in a stiff plastic sleeve. 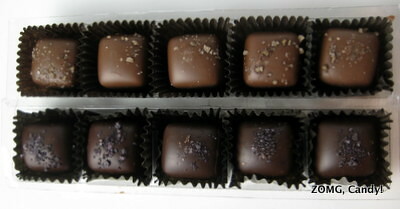 Merlot had a dark chocolate shell, while chardonnay’s was milk chocolate. Both were generously topped with salt sprinkles. 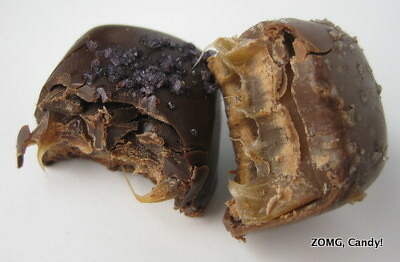 The caramels were stiffly chewy and sticky. 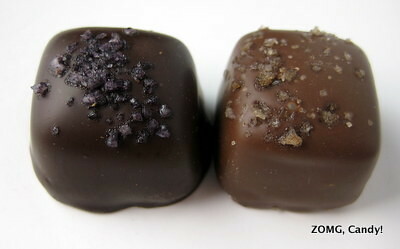 Merlot’s caramel had an amazingly bright fruitiness, while the dark chocolate had the taste of cherries to its finish. Chardonnay’s milk chocolate was sweeter with dusky caramel notes to it. Its caramel was butterscotch-y, without the great fruitiness of the merlot. I liked Merlot (OMG) much more than the Chardonnay (OM) because of its fruity complexity. 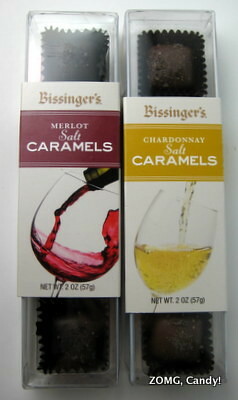 I didn’t really get any actual wine flavors, but these were still solid chocolate-covered salted caramels. I should note, however, that these were not cheap. At full price, they were $12.25 for the 5. I got them at half price ($6.12), which made them more worth it.